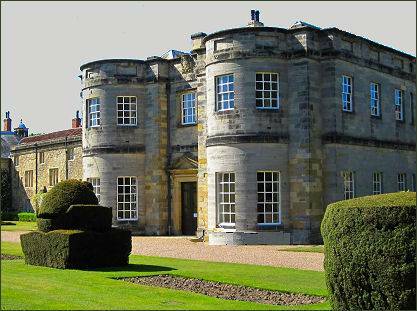 Newburgh Priory is a large and imposing house near to the village of Coxwold and occupies the site of an Augustinian priory, founded in 1145. The house has wonderful views to the Kilburn White Horse in the distance. Through the iron gates is the huge stable block, then the house which faces north over the countryside and was built to the sixteenth century design of a hall block with projecting wings, the attractive grounds contain a water garden, walled garden, topiary yews and woodland walks. The Augustinian priory was founded on lands originally granted by King William the Conqueror to the Norman lord Robert de Mowbray. The priory was established by his son Roger de Mowbray in 1145. The first canons came from an Augustinian house at Bridlington. The Priory was the home of William of Newburgh, the author of the Historia rerum Anglicarum, which covered the events of 1066-1198. Roger's grandson, William de Mowbray, was also a benefactor and was buried there in about 1222. Margaret Tudor, the daughter of Henry VII stayed a night there on 17 August 1503 as a guest of the Prior during her progress to meet her future husband King James IV of Scotland. Following the Dissolution of the Monasteries in 1538, Anthony de Bellasis, a royal chaplain, bought the priory for £1,062. Anthony, with his brother Richard, had been responsible for the dissolution of not only Newburgh, but also eight other monasteries in the north of England. His nephew Sir William Bellasis (1524-1604) converted Newburgh into a private residence in 1546. The Priory today remains much the same as it was during the Tudor period. Sir William Bellasis was appointed High Sheriff of Yorkshire for 1574-75. His eldest surviving son Henry was several times MP for Thirsk, once for Aldborough and High Sheriff for 1603-04. In 1611, he became one of the first baronets. His son Thomas Belasyse, 1st Viscount Fauconberg, also MP for Thirsk, succeeded him and took the title of Fauconberg when created a baron in 1627 (and viscount in 1643). The viscount's grandson Thomas married Oliver Cromwell's daughter and was created Earl Fauconberg in 1689. Between 1720 and 1760, Thomas Fauconberg, Lord of the Bedchamber to King George III, and the then owner of the property, embarked on a major modernisation of the building, this included the building of the striking bow fronted block to the east. There are several fine rooms in the house, namely the Dining Room and the small and large Drawing Rooms, all of which contain impressive collections of furniture, porcelain, and family portraits. The property then descended through generations to Henry Belasyse, 2nd Earl Fauconberg. On his death in 1802 the earldom became extinct and Newburgh was left to Lady Charlotte, his eldest daughter, who had married Thomas Wynn. He took the surname Belasyse and was High Sheriff in 1810-11. On Lady Charlotte's death in 1825 without male heir, the estate passed to George Wombwell, 3rd Baronet, the son of her sister Lady Anne, who had married Sir George Wombwell, 2nd Baronet in 1791. The 3rd Baronet's son, Sir George Orby Wombwell, 4th Baronet, was a survivor of the Charge of the Light Brigade and High Sheriff for 1861. Newburgh Priory is reputed to be the final resting place of Oliver Cromwell. It is said that Mary, Countess of Fauconberg and Cromwell's daughter, used her influence to rescue his remains after they were removed from Westminster Abbey after the restoration of Charles II.. Originally the stone tomb was hidden in the roof space, but when the house was remodelled and the roof was raised, the tomb was incorporated as part of the room itself. The family has never allowed the tomb to be opened, so the contents remain a mystery to this day. 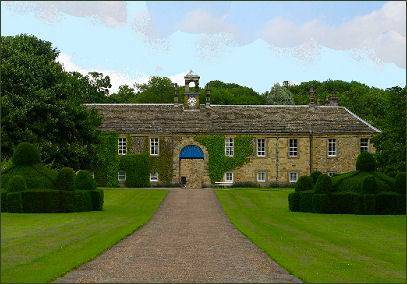 The priory is today the family seat of Sir George and Lady Wombwell who open the estate to the public in April, May and June.